Arrange oven racks to the center of the oven. Preheat the oven to 350°F. Line two large baking sheets with parchment paper and set aside. Add the egg white and water to a large bowl and whisk vigorously until foamy and light. Add the nuts to the egg white mixture and use a large spatula to mix the nuts until they are completely wet with egg white. There shouldn’t be any liquid remaining at the bottom of the bowl. 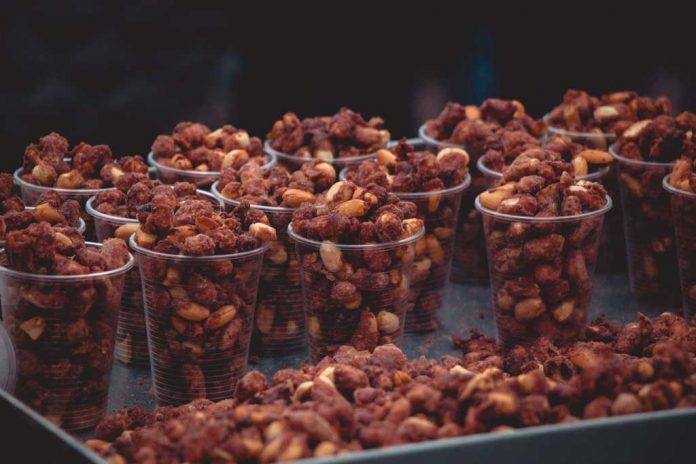 If there is excess liquid, add more nuts and continue to toss until they are completely coated. Add the spice mixture to the nuts and mix until completely coated. Divide the nuts between the two baking sheets and spread evenly into a single layer. Place one pan on the upper rack and the other on the lower rack and bake for 10 minutes. Remove the nuts and stir or flip them. Spread into a single layer and bake for an additional 10 minutes. Cool on the baking sheets then transfer an airtight container for storage.